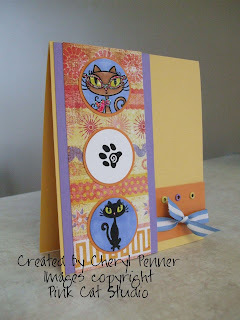 My creative Therapy: Another cat card! This is another card from my upcoming copics class. Again, the stamps are from Pink Cat studio and they are colored with copics. Pink Cat Studio stamps are so perfect to use with the copics because the lines are just a bit thicker. I have left off the sentiment, so it could be used for any occasion or to leave the option of adding a sentiment when I go to use it! Just like the others from this class, the eyes were covered with diamond glaze and the glasses were stickled. Enjoy! these cats are so cute, i like the papers and the design. I am loving your cat cards. These colors are great.